This community centered, collaborative outreach project is based on an African tradition of sealed amulets containing powerful contents such as sacred text and medicines. It seeks to bring together people of many cultures, creeds, and ethnicities through the physical manifestation of collaborative art. The artist curator of the exhibit, Sonya Clark, will present a hands-on workshop to introduce the concept of beaded prayer packets. The packets each contain a secret wish, question or prayer sealed within. Participants will create two packets; one to keep and one to become part of the ever-growing traveling exhibition. 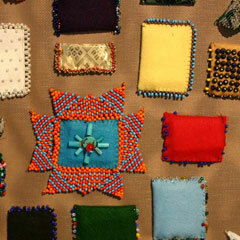 The beaded prayers are mounted on numerous panels measuring 2’ x 2’ which are mounted around the gallery walls. Initiated in 1999, the project currently includes over 4,500 packets from 35 nations. Clark’s inspiration for the project came from African amulets, the shared word history of “bead” and “prayer” (the Old English word “biddan” meant “to ask or to pray”), collaborative artworks like the Names AIDS Memorial Quilt, and the power of secrecy.